"Well, I guess that's the way it goes... one out and one in." 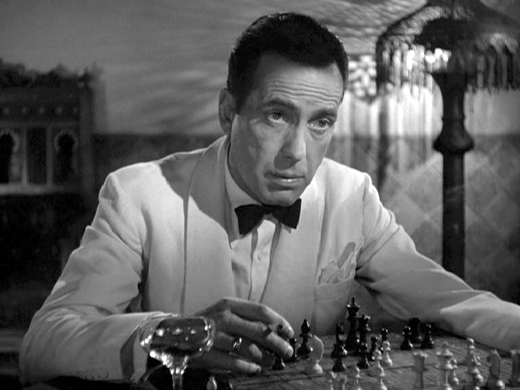 Rick Blaine (Humphrey Bogart) said it best. Ugarte has been arrested. Ilsa just walked in to the club. One of my beloved Nikon D70s bodies just went kaput. I had nicknamed it "High Miles" because this EBay special, while pristine on the outside, had nearly 20,000 shutter actuations when I got it. It served me well, but succumbed to the twin maladies of a failed card interface and an auto focusing problem, both of which were revealed during a routine sensor cleaning. The card interface is/was a well documented problem with the earlier D70, and was supposedly fixed in the D70s. I can state that the camera's demise had nothing to do with the number of shutter actuations, the real subject of this post. Single lens reflex cameras are complicated pieces of machinery with lots of moving parts. And like most modern things, repairs usually entail the replacement of an entire module rather than a detailed inspection and targeted repair. Typically, a shutter mechanism replacement will run around $300.00 and in some cases is more than the camera is worth. Then too, you replace the shutter and then the mirror box goes out. The aforementioned card interface replacement costs about $250.00, which I had done on another D70s body. I'm just guessing on the cost of addressing the auto focus problem, but a potential repair bill of $500.00 doesn't make sense for a camera that I only paid $250.00 for, if that. A new, older D70 body has come into my life. Nicknamed the "Centipede", the body was purchased for the princely sum of $100.00. The firmware had been properly updated. But was my new purchase lemon or lemonade? The body cleaned up nicely, and I resisted the urge to immediately clean the sensor. Instead, I ran an Opanda check. For my new Nikon D70 Body, the selected image was actuation #9,822. 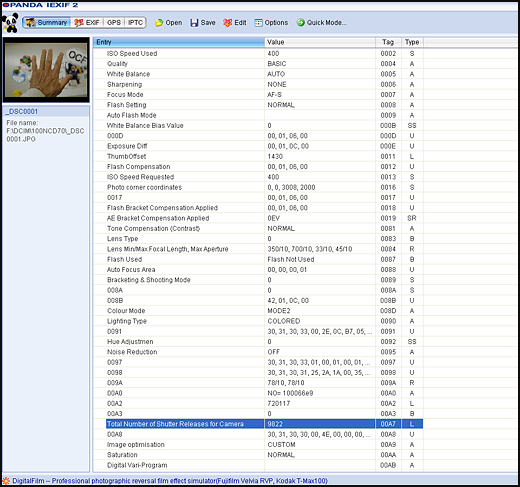 A serious used camera shopper might consider downloading Opanda to his or her laptop and carry it when shopping. When a likely purchase shows up, one could make a quick reference photo and save it to the SD or CF card you just happen to be carrying. Open the Opanda application and read the card using the computer's built-in SD slot or an accessory card reader. A too high shutter count could be the deal breaker. Incidentally, this won't work on older DSLRs and Point and Shoots of any vintage. This web site allows you to evaluate how far along your camera is, so far as expected shutter life. 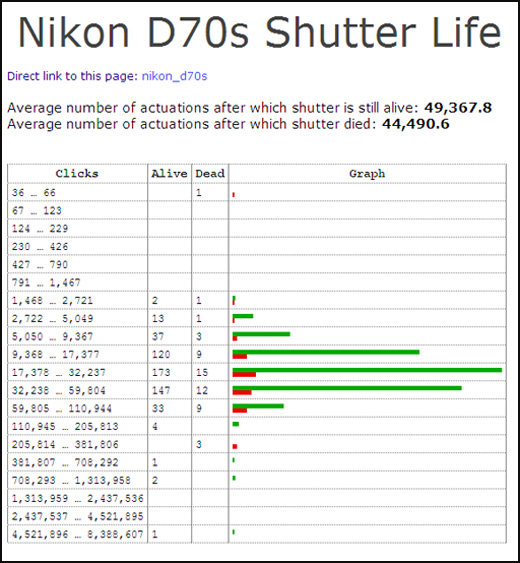 As I said earlier, this gives real world data from camera users who submit the shutter count when a wide variety of cameras "die". Lies, Damn Lies, and Statistics. Mark Twain had that right. For the most part, I use this data as an indicator of when my camera is getting ready to bite the dust. Based on these figures, my little D70 has a ways to go. But as it gets further along in years, I'll be less likely to carry the camera for any serious photographic outings. Why The Names? I started naming my D70 bodies because some of them had faults that could affect their reliability if I carried them on an assignment. Two of the bodies have non-functioning pop-up flashes, which is handy to know if I ever needed to use the built-in as a Commander. Two have a strange sensor problem that occasionally yield images with smears or odd color interptetations. These shortcomings a listed , along with their nicknames, on a stick-on label that I attach to the LCD protector. If I really need a reliable body, I'll choose either "Prestine" or "Best One Yet", knowing that they have been checked and have had no functional issues to this point.